Cap - 1 1/4" x 5/16", 90 degrees to clip. for second location of repeating copy or personalization (up to 25 characters). Medium Point Ballpoint or Roller Ball: Black Ink. Ballpoint version available in Gel (black ink) - add $.55 per pen. Please allow for additional working days on your order for a gel ink option. 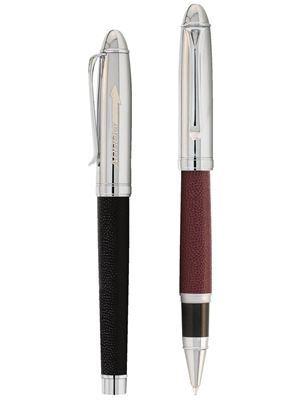 Add $8.25 to your choice of any Leather pen. Click here. All with polished chrome plated clip, trim and cap. Two-piece black gift box with velvet lining included. inside the gift box to ensure longer life. Weight is 10 lbs. (approx.) @ 50 per carton. Click here for shipping information, 2-day service at ground rates. BIC Air Express 1 Day Air. Perfect With a BIC Notebook!